Hello, hello! Regular readers of this blog or my Facebook page may have noticed this already from the copious updates, but I'm LOVING this week's main project - Pixie Moon. She still needs a right arm (tonight's job) and some more hair. Oh, and some facial features. I'm really hoping she'll be ready for a reveal on Friday - although she will be unlikely to have any clothes until after the weekend. Here's a peek. More pics can be seen on the project notes. Perusing some of my favourite blogs this week, I enjoyed reading this post and as my other projects have remained almost entirely abandoned this week, I figured I'd skip the mostly pointless "progress" shots and show you instead where they all live during inactive periods. The concept of a knitting/crafting "bag" was abandoned quite soon after learning to knit, as it was clear I'd never fit everything in a single bag. I seem instead to have an ever-increasing collection of things dotted about my Cwtch, especially around the armchair where the Leisa Loop is still waiting for some attention, the hexipuffs for my Beekeeper's Quilt are hidden (can you spot them in that basket to the side of the chair?) and 16 balls of yarn that just arrived are waiting to be put away (... not sure where). There is also a Hexibag hanging on the door, a large tub containing two crochet projects tucked away under the table (Sitting Room Circles and Lula), a 'Pixie corner' and a basket of scrap yarn with the still unfinished crochet slippers (although last week there was just one sole, so that's SOME progress)! Oh, and a little plastic wallet containing a "mini mobile hexipuff kit" which gets moved from bag to bag so I can knit a few rows whenever I get the chance. Once the yarn is hidden put away, it should look quite tidy again, but it does make me glad I have the luxury of my own little sitting room, or I don't know how I'd keep so many things on the go. How do you store your projects? see more WIPs via the links at Tami's blog. I wish I had a craft room! I don't have much space, so I have sock on the go usually sat on the coffee table, cardigan on the go sat on my (generally unused) desk, other project on the go sat on top of my stash storage and secret projects crammed wherever I can fit them! You know what, I *have* a craft room. 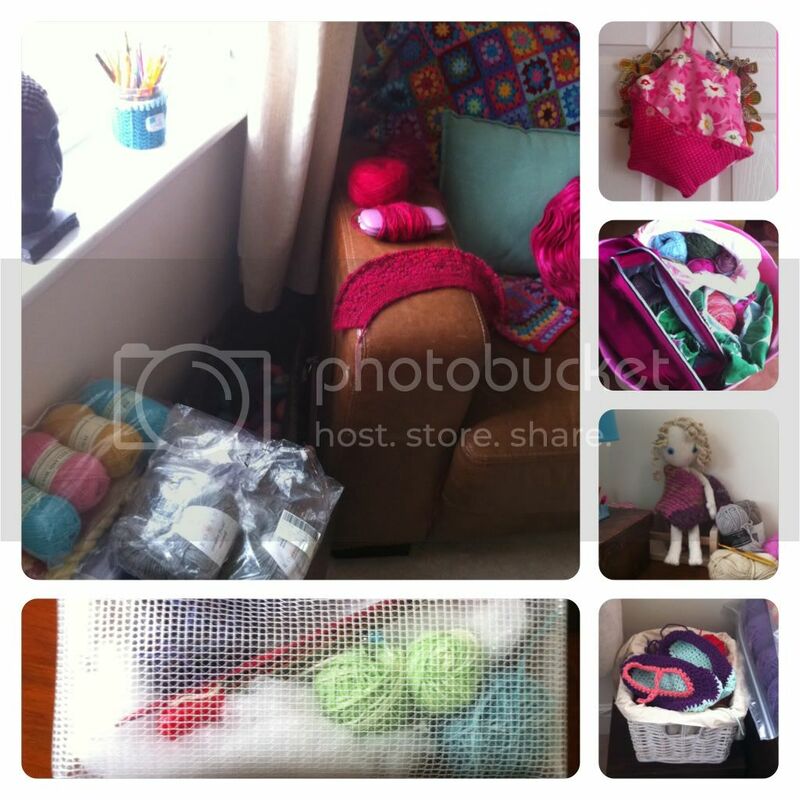 I keep most of my stuff there, but still I find myself crocheting in the living room, on the sofa! ;) As a result, lots of crafty stuff accumulates on the windowsill. oh I dream of a craft room but at the moment my whole house is my craft room! Yarn stashed in any place big enough to take it. Only problem is it used to be organised chaos and now it's just.... well chaos! Looks like you have such a cozy and colorful work space! the doll is looking great! Hello Sarah! Pixie Moon looks sooooooooooooo sweet! 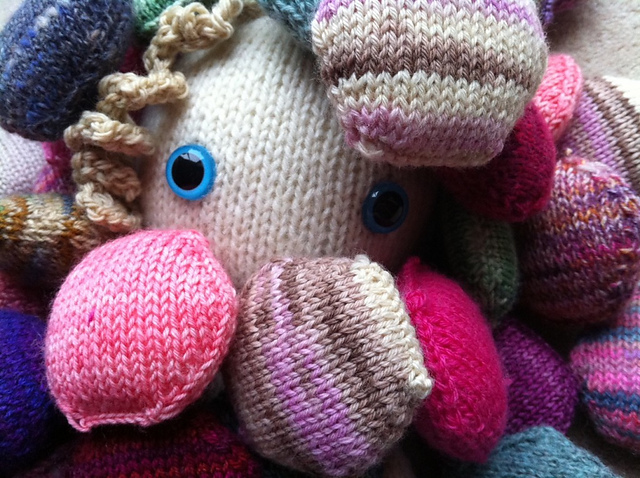 I love her peeking out from all the hexipuffs! My house is my craft room and KB grudginly puts up with knitting needles in the fruit bowl and wool on every surface... until wool ends up on her chair, then she does not like so much! :OD We are moving soon and she wants a three bedroom house so I can have a wool room, ha ha thats one way to get your own craft room, drive your partner crazy enough with it! I'm loving the doll, she's adorable! Your craft room looks great! My crochet chair looks almost exactly like yours!!! Love the almost done Pixie Moon, looks like she will be adorable! Oh, Pixie Moon looks so sweet, I can't wait to see her all finished! And I'd love my own craft room, as it is my stuff is stashed all over the house. My WiPs basket by the couch constantly overfills and I have to wrangle it into submission on a regular basis! Oh lucky you having a craft room. Actually I have 2 craft rooms....our family room and the bedroom! I craft in them, and storage is mostly planned around my craft stuff therefore they are my craft rooms, right? ;) We have a huge sideboard in the family room which the wonderful man bought just for yarn storage, and he recently bought and restored a bureau for the same purpose, in the same room. He knows my needs lol. Your little friend is looking great, how lucky someone will be, to have that little dolly. Pixie Moon is so sweet! I love that photo of her peeking out from under all of those pretty puffs. I just finished redoing my bedroom and now have a combo craft space/bedroom. But I have yarn and projects pretty much everywhere still. I like to display them in baskets around the house. I am going to steal your mini mobile hexipuff kit idea! I jut love the feelong of being surrounded by yarn and WIPs! The craft room loks sooo nice. Can't wait for pixie moon to be finished. She already looks really nice. I'm also behind on a lot of projects, need to make some more hooky time haha. I wish I could have a craft room. I have to settle with fabric bins in a big closet and cute tote bags filled with one project each.